NIU’s Division of Student Affairs & Enrollment Managment has welcomed Eric Armstrong as the new director of Military & Post-Traditional Student Services (formerly Military Student Services and Off-Campus & Non-Traditional Student Services). A native of Chicago, Armstrong earned a bachelor’s degree in technical management with a concentration in human resources from DeVry University and an M.B.A. from Keller Graduate School of Management. The third-generation Marine who served four years in the U.S. Marine Corps before college, Armstrong achieved the rank of corporal while deploying twice with the 15th Marine Expeditionary Unit (Operation Enduring Freedom and Operation Iraqi Freedom). When he speaks with student veterans, the conversation always moves to their goals and graduation. He continually challenges student veterans to look at the big picture, become involved and use the college experience to better themselves. 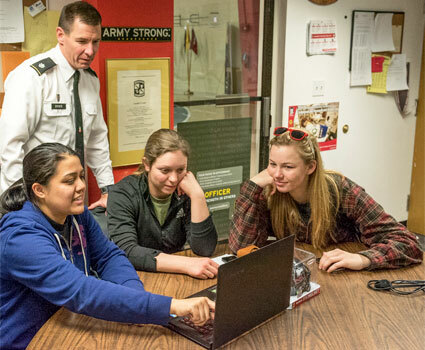 For his part, he will use the merger of Military Student Services and Off Campus and Non-Traditional Student Services to develop new, student-centered programming. He also makes it a point to interact with students on campus, keeping his door open to thoughts and ideas of the campus community. As a former non-traditional student, Armstrong understands the challenges this population of students faces on a daily basis. His goal is to reach out to non-traditional students with programming that will enhance their student experience at NIU while respecting their valuable time. Prior to his arrival at NIU, Armstrong has touched almost every aspect of student affairs and enrollment management. He has worked in admissions, academic advising and in the Office of the Registrar before serving almost four years at the University of Illinois at Chicago as the assistant director of Student Veteran Affairs and and a VA certifying official. It was during that tenure that he advocated for the student veterans on campus to promote awareness of veteran issues and increase student success. Armstrong also serves on the state board of Phi Beta Sigma Fraternity, Inc. as education coordinator, working to bring awareness of scholarship opportunities to statewide chapters.